Coloured Corns: Red, Blue, Purple And Black - The 'New' Super-foods! These varieties of corn actually exist and are fast gaining prominence as one of the 'super-foods'. It is roasted, used in desserts and stews. Been cultivated for more than 3,000 years, the coloured corns used to be a major food source in the ancient times for the Aztecs (the Mesoamerican culture that flourished in central Mexico in the post-classic period from 1300 to 1521.). Still today, the variety remains popular, being used in many local desserts and drinks. Grown extensively in Mizoram, these coloured corns are really popular with the locals. It is locally known as Mim Ban, which literally means sticky corn. The Mizos have been actively cultivating and consuming these lesser-known varieties of corn from a long time. These varieties have sweet, nutty flavour which intensifies on cooking. The presence of high phenolic content and anthocyanins is responsible for its distinct colour, which may be present in higher or lower quantities depending on the colour. ✔️ POWERHOUSE OF ANTIOXIDANTS - these corns have the potential to fight obesity and diabetes. ✔️ ANTI-AGEING, ANTI-INFLAMMATORY, ANTI-CANCER PROPERTIES - studies found that consuming these corns will significantly reduce any inflammations in the body. Due to the presence of a high amount of antioxidants, these corns have been associated with having anti-ageing properties. ✔️ IMPROVES THE NERVOUS SYSTEM, EYES AND HEART - these variety of corns can improve the functioning of the nervous system, lower blood pressure and also enhance kidney health. It also has the ability to reduce any serious eye disease. 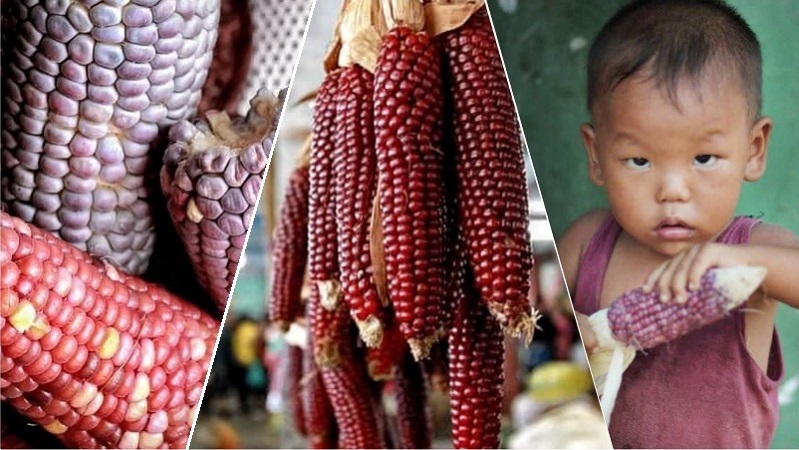 Though not as popular as the white or yellow corns, the purple, blue, red and black corns can be found in abundance in the South American countries - where they can be enjoyed as hot 'corn on the cob’ dishes. In America, these can be seen converted into varieties of packed chips, popcorns or flours. Indians needn’t go that far though. You just need to travel far up the seven sisters and discover this treasure.